Trippier had one year remaining on his previous contract and, had there been no new deal signed, it could have potentially forced us to sell him this summer or seen him walk away in a year's time. I think we were always confident he wanted to stay. Since the season ended he has spoken about signing for Burnley being the best footballing decision he's ever made and how happy he is at Turf Moor. That has resulted in this new deal that ties him to us until the end of the 2016/17 season, along with fellow full back Danny Lafferty, and strikers Sam Vokes and Ashley Barnes. It is one of the big key decisions that we'll make over the summer and I think you'd be hard pushed to find a Burnley fan this morning who isn't delighted with the news. Text messages I have received from friends this morning have simply said either: "Fantastic news", or "Brilliant news". The message board thread is simply headed Best news of the closed season? and carries the same messages, as we all delight in knowing that the best right-back in the Championship will be lining up in the number two shirt again for us for the foreseeable future. 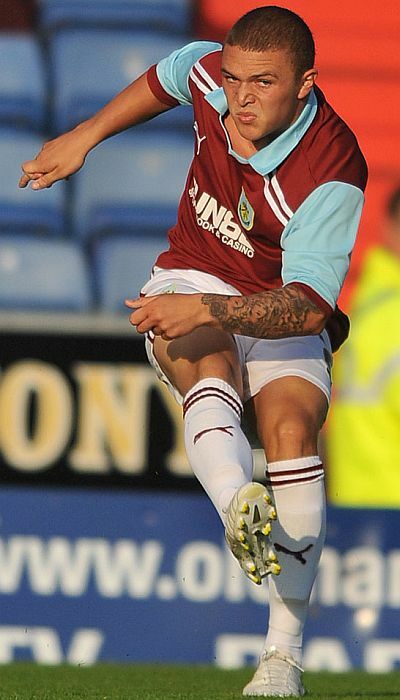 Trippier first arrived at Burnley on 26th July 2011 on a season long loan from Manchester City. He was the second signing that summer, following a similar deal for Ben Mee, and was rushed through once we knew Tyrone Mears was on his way to Bolton. The England under-21 international went straight into the team that night for a friendly against Oldham. He looked ok but caused me some confusion when we defended a corner and he and Alex MacDonald defended the posts; I could hardly tell them apart from the back of the away stand. Such were his performances in the first half of that first season that fans were already talking about their hopes of a permanent deal and it came early in the very next transfer window when he signed a two and a half year deal on 3rd January 2012, just a day after he'd ridiculously been sent off at Leeds. Then manager Eddie Howe said: "We are absolutely delighted to have Kieran on board. He has been a really huge part of our team, how we have played this year and how we want to go forward. He has just got better and better and I can't speak highly enough of him as a person and as a footballer." Interestingly, Trippier said at the time: "There is a lot of ambition here to get back into the Premier League and I think we can do it." He went on to win a place in the PFA's Championship team that season. That's something he's repeated this season and I think it is fair to say that he's had three good seasons with us and has just continued to get better and better with his defensive work coming on leaps and bounds in Sean Dyche's framework to add to his undoubted attacking abilities. It's an excellent way to end the month of May as we look forward to our return to the big league in August with that little bit more enthusiasm knowing we'll be going in there with one of the league's best right-backs.